Do you have pain or stiffness in your hips? If so, it might be time to consult with an orthopedic clinic. Many people associate these aches and pains with getting older, but severe pain and tightness should never be mistaken for the normal aging process. If you experience any of the following symptoms, contact your physician for a referral to an orthopedic center in Jacksonville, FL. Occasional hip or knee pain happens, especially if you’re on your feet all day or you engage in high-impact fitness activities. However, when the pain doesn’t subside normally, and it interferes with daily activities, it’s time to consult a doctor. Daily activities that this type of pain affects include climbing stairs, getting in and out of a car, getting into the bathtub, walking short distances, etc. Debilitating pain affects your quality of life and can lead to depression and isolation. Get ahead of these problems and seek out orthopedic care. It’s normal to feel some stiffness in your joints when waking up in the morning. You might have slept in an awkward position or your body just needs a bit of time to wake up fully. When the stiffness lasts for longer than 30 minutes, this is often a sign of rheumatoid arthritis (RA). This condition causes inflammation that affects smaller joints in the feet and hands. Unfortunately, RA doesn’t have a cure. However, there are several treatments available to lessen the symptoms and help you manage the stiffness and pain. Take a look at your hip, whatever part is hurting. Is it swollen? Did you injure it without realizing it? If you can’t think of a reason why your hip might be swollen, schedule an appointment with an orthopod in Jacksonville, FL. There are a number of reasons why this part of your body might swell. A common issue in people over 40 and those who participate in strenuous activities is a condition called bursitis. This condition is caused when fluid builds up in between the joints. It’s not a serious condition, but is rather painful and can take several months to feel better. Often, bursitis doesn’t require surgery. Your orthopedic doctor will likely prescribe rest, ice, and anti-inflammatory therapies. 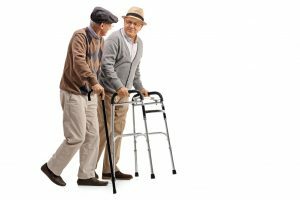 Have you been relying on a cane or walker to help you manage the pain and get around? If these walking aids no longer make the pain bearable, contact an orthopedic specialist. It might be time to talk about invasive procedures such as hip replacement to improve mobility and quality of life. Don’t take your ability to move with ease for granted. Even if you’re older and think that bone and joint problems come with the added years, contact Southeast Orthopedic Specialists, an orthopedic clinic in Jacksonville, FL, to learn more about your treatment options.